Winchester City Mill is an attractive mill on the pretty River Itchen. It is working today and fresh stoneground wholemeal flour can be bought at the Mill Shop! Nowadays it is owned by the National Trust but there has been a mill on the site for over a thousand years. Saxon folk in Winchester were baking the flour ground there by millers, who were lessee's of the Benedictine nunnery of nearby Wherwell, for 200 years. Winchester City Mill is a fascinating place to visit. The mill waters rush, the lawns are inviting, the water wheel and its gears can be seen working. The flour milling demonstrations are at weekends. Got a bread making machine? Why not try baking with stone ground flour from the Winchester City Mill! In its early days the mill was known as the Eastgate Mill being rather obviously close to the East Gate behind where King Alfred's statue stands today. How it became the City Mill is down to Queen Mary Tudor, daughter of Henry VIII. She gave the mill to the City after her grand wedding to Philip of Spain in 1554 in Winchester Cathedral. The gift was in part payment to the city of the costs of her wedding. Queen Mary had inherited the mill from her father who had acquired it during his Dissolution of the Monasteries in 1539, Wherwell Abbey who owned the mill being included in that Dissolution. To start with the mill was a prosperous affair. Recorded in the Doomsday Book with a rental value well in excess of ordinary mills it was an excellent asset to the well run Wherwell Abbey.. The 1300's saw the Mill's decline. Bad harvests due to the first Little Ice Age in Europe which lasted for many years meant little corn for milling and general financial decline. The Black Death in 1348 added to the problems It killed at least thirty per cent of the population and some estimates put it much higher. An economic as well as a human disaster. Fewer mouths to feed, but fewer folk to plant and harvest the crops. Winchester had been a major centre of the wool trade, but when Calais became the 'brightest jewel in the crown' and the leading staple port for the import of wool to Europe the city lost its status and further serious financial loss followed. By 1471 the mill was sonewhat derelict. By the time of the Dissolution in 1539 the city was in serious financial stress. It does not seem that the Mill was much of a gift to the City those few years later.. But for cash strapped Winchester faced with a lavish Royal Wedding anything was helpful! The City tried to make a go of it by leasing the mill out,. With so little cash to spare they did not restore the mill properly and because of this only received a small yearly rent. Not a lot of help to the city. Fortunes change, but the mill had two hundred years of neglect and poverty until 1743. At that time a new lease was signed with James Cook, who rebuilt the mill we see today. For the romantics in us, some of the materials in the ancient mill were recycled. Nearly a hundred years later the mill was sold to John Benham. His family operated it for a century or so until technology overtook the milling industry as it did many other industries. Roller milling in factories made stone grinding obsolete. The mill again was insolvent. After short stint as a laundry during WWI, then a good idea! 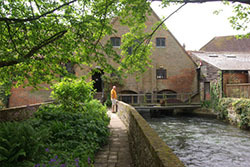 The mill was bought by some far sighted local people as a donation to the National Trust. For many years the Youth Hostels Association leased it as a Hostel, but with access for the public over parts of the mill. In that setting it was quite a pretty hostel. 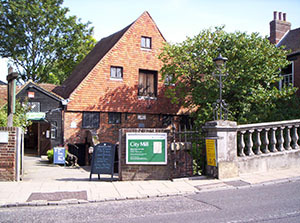 Nowadays the City Mill operates as a full National Trust attraction after a successful restoration programme. From Abbey Park in Broadway walk along past King Alfred's statue to the river. You will find the mill alongside the bridge on the left hand side. Be careful crossing this narrow road can get a bit busy at times. There is no parking at City Mill, but there is parking nearby. For opening times and admission prices check the website.